On September 29, 1998, Outkast dropped their third album, Aquemini, so named after the portmanteau of Big and Dre’s zodiac signs, Aquarius and Gemini, respectively. It was their level all the way up album. The Source, still relevant at the time, gave it the vaunted 5 Mic rating, making it a classic. The album is where Big Boi’s street savvy, down home rap-tune style meshed perfectly with Andre 3000's spacey, virtuoso lyrical attacks over some of the dopest, innovative funk-laden production stylings to date. Aquemini is where the best parts of Outkast all came together and leapt over the moon. It’s also the album where folks outside of the South had to not only take notice, but respect the duo. Andre famously told the audience at The Source Awards in New York City in 1995 that “the South got something to say,” and by the time Aquemini dropped, everybody was listening. It was that effective and that good. And it was an album that it took me a little while to come completely around on, though I got there because, duh. Let’s start at the beginning. I’m a Southerner so Outkast was then and still is among my favorite musical acts of all time. I still remember seeing the “Player’s Ball” video (the remix to the record might be my 2nd favorite Outkast song ever) and feeling like them boys knew my streets. I loved everything about their debut album Southernplayalisticadillacmuzik. But ATLiens ... ATLiens is the album where I fell in love with the group. ATLiens is my favorite Outkast album, and that hasn’t and won’t change. Hearing “Elevators (Me & U)“ each time is like hearing it the first time. But I had a similar experience with “Skew It On The Bar-B.” I had just pulled into my parking space at my house in Atlanta, probably in the evening hours of August in 1998. I heard what sounded like Andre and then, is that...RAEKWON!???!!! And then Big Boi closed it out. I wanted to hear it all the time. I knew an album was coming and it’s Outkast, coming off the heels of ATLiens, I was all in and couldn’t wait. The day before the album release—September 28, 1998—I remember going to Audrey’s, the music store we had across from the Atlanta University Center Robert Woodruff Library (Club Woody, for short) and listening to Aquemini. Audrey’s had listening stations where you could sit and check out any of the albums she had for sale in the store. Though I loved “Skew It On the Bar-B,” I wasn’t in love with the whole album. Until I got to “SpottieOttieDopaliscious” (one of the greatest musical productions of all time, fight me bro) which I probably listened to a solid 10 times while sitting in the record store. My God. My lawd. Despite the fact that I always wanted verses on that album, the poetry was perfect and Sleepy Brown’s intro??? And Dre singing DAMN DAMN DAMN JAMES!!! Then “Liberation.” And “Chonkyfire.” I remember liking “West Savannah” because of the throwback vibe. I didn’t buy it on that Monday. But I went back on Tuesday (a great day in hip-hop album release history) and bought that album (because it was Outkast) along with Jay-Z’s Vol. 2 and A Tribe Called Quests’s The Love Movement. Once I sat with it and really listened, my whole outlook on it changed. From the intro “Hold On Be Strong” I felt myself fall into the music and the production and the ... aura. I listened. “Return of the ‘G’” starts out with Dre talking about niggas always talking about peace this and peace that and then he just let loose, both he and Big addressing all the haters and rumors and bootychatter floating around the group. Then I got it; then I took it in. And the musical world opened up. “Rosa Parks” is PERFECT. Literally, it is a perfect record. It is literally the epitome of beats, rhymes and life. As is “Liberation.” Cee-lo’s harmonious harmoniousness blends with Erykah Badu so well I feel like they owe us all a record. I could go into depth on each record, but the truth is, they’re all good. The only record I don’t love now (and didn’t then, either) is “Slump” and I have no really good reason why. Right now, I can still listen to this album start to finish—“Slump” included—and not feel compelled to stop it or turn it. I literally build up to waiting for “SpottieOttieDopaliscious” while wishing for the Pimp Trick Gangsta Clique album that Joi implied was a possibility on her episode of the Questlove Supreme podcast. While ATLiens is my favorite, Aquemini KNOCKS. This album bumps in the ride like it was meant for to be heard through two 15-inch subs in the trunk. It’s trunk rattlin’ music while being substantive. It’s the literal whole package of an album. 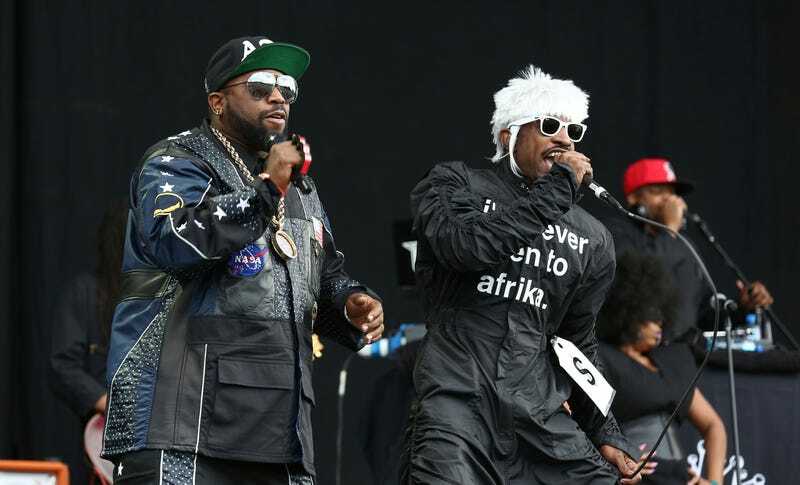 Outkast continued their innovation with Stankonia and I could argue that “Bombs Over Baghdad” is possibly their best record, but as a whole package of being commercially viable and accessible while being truly Southern-funk inspired hip-hop, Aquemini is the gold-standard, one that so many other southern acts abandoned even trying to copy. Aquemini stood alone then, and stands alone even now. Do you wanna bump and slump with us? Yes. That’s liberation. Aquemini gave us that, and 20 years later it still bumps like it did in 1998.